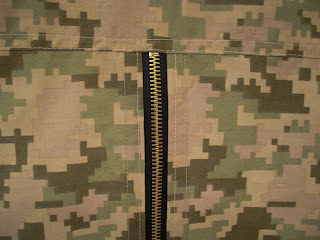 Obsessively Stitching: Tent Week, Day Three -- Army Bunker Tent! Tent Week, Day Three -- Army Bunker Tent! 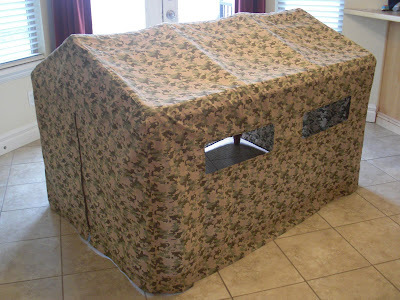 Today I want to show you how I made this army bunker tent to fit my kitchen table!! ~ It's BIG -- plenty of room for a few kids to hang out in there! ~ It breaks down small enough to fit inside a pillowcase -- easy storage, and doesn't take up much space! ~ I made the whole thing from one twin sheet set ($13), one thrifted laundry bag ($1), a couple canvas belts (on hand), a "reversible" zipper -- tabs on both sides so nobody gets stuck inside! (a whopping $5.50! ), and some PVC pipe (totaling about $7) -- for a total cost of $26.50!! 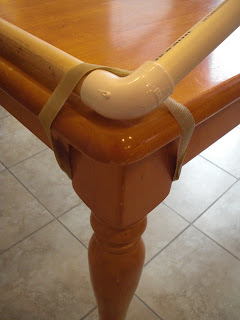 PVC pipe is very fun, cheap, and easy to work with. I made a simple frame to fit my kitchen table using 4 "T" fittings, 4 90 degree elbows, and 4 of what they call 45 degree angle fittings. (They are actually 135 degrees -- for some reason they measure the outside of the angle?) I opted not to do a bar across the peak of the roof, simply because there are no pipe fittings that allow this when you are using 45 degree angle fittings. I could have used 90 degree fittings to get a bar across the top, but I prefer the lower angle -- it used less fabric, and is more realistic for this particular tent! To secure the pipe roof frame to my table, I simply used 18" of velcro (you need 18" of both the hook and the loop sides) for each corner, overlapping a couple inches on each to make a long strap. I then wrapped a velcro strap through each corner of my pipe frame and around each corresponding leg of the table. 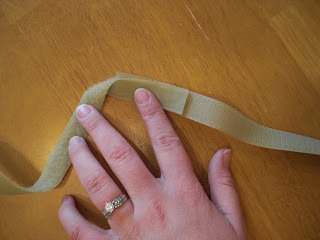 I snipped next to the stitching that secured the elastic in the fitted sheet and pulled the elastic right out. Easy! (I've saved it for another project, of course!) I then cut along the seams that made the boxed corners of the fitted sheet. This gave me a nice, flat piece of fabric to work with. Oh, and those casings for the elastic? 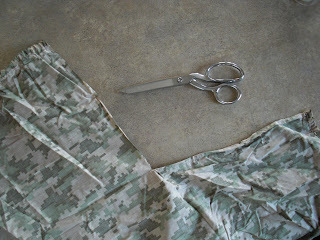 After a quick press they made perfect little hems to be utilized in my cutting layout! Yay for shortcuts!! Okay, since kitchen tables are not one standard size, I can't give you exact measurements to make your own. But I will tell you the basic construction of my tent. I laid the flat sheet over the table (with the frame strapped on). It was slightly wider than the long sides of my table, and 11 inches short of making it to the floor on either side. I split the sheet straight down the middle (so I could utilize those already-hemmed edges in my tent! 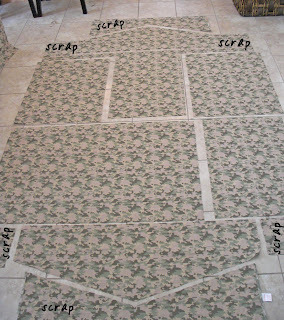 ), and needed to add a strip down the center to make up for the needed length. I drew up some pattern pieces for the peaks of my tent. I decided to have the peak portion of each end be separate from the lower part. (I had the lower part start just below the apron of the table, to avoid little ones bonking their heads on the table when entering the tent.) I was determined to make it all fit on the sheet, so I used graph paper to draft the dimensions of the fitted sheet (accounting for those missing corners), and also the pattern pieces I needed to cut. I scooted those little graph paper pattern pieces around on the graph paper until I found a layout that worked for fitting everything. I ended up piecing the strip at the peak of the roof, but this was not a problem at all. As you can see, there really wasn't much left of the sheet! I wanted a little extra structure across the peak of the tent, so I busted out two canvas belts, sewed them together end-to-end, then sewed them across the peak of the tent. I also sewed velcro straps onto the canvas belts to strap to each peak of the pipe frame for added security (not pictured). To make the windows (two on each long side), I cut a rectangle two inches smaller in height and width than I wanted the finished dimensions to be. I marked 1" out from each corner, then cut from each corner of my hole to the dot. I pressed the seam allowances to the wrong side. I used a thrifted mesh laundry bag for the windows. 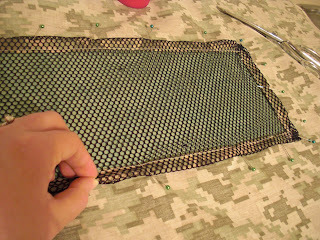 I sewed a piece of the mesh right on the pressed edges of the window (it took about a million pins to make it behave! 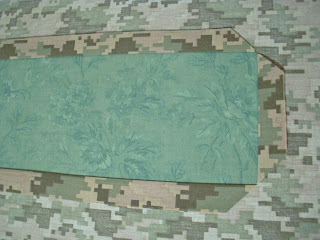 ), then trimmed the mesh to match the seam allowance of the tent fabric. I then turned both the mesh and the tent fabric in again to create a finished edge, pinning like crazy and sewing along the folded edge. 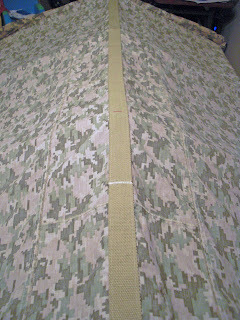 I double-topstitched all the seams for added stability and for that "utilitarian" look. 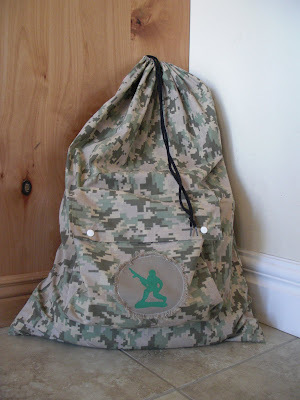 I made the storage bag from the pillowcase simply by adding a drawstring. Everything fits inside perfectly! 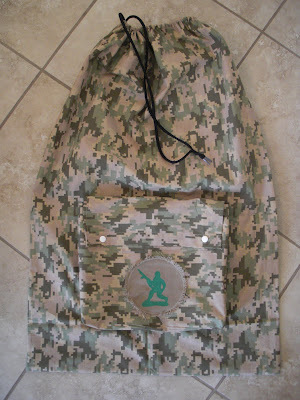 I decided to add the pouch the sheets came in for extra interest, with a little freezer paper stenciled plastic army guy patch. Both the piece of twill I used for the patch AND the drawstring came from the thrifted laundry bag I used for the windows! There were even just enough leftover scraps from the sheets to make little drawstring bags for my boys' plastic army guys. More patches too, of course! I had tons of fun thinking about and planning this tent. I spent a long time on it to make sure it turned out just as I envisioned -- and it did! 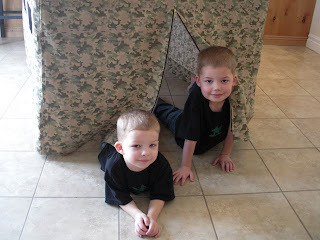 And best of all, my boys LOVE their new tent! This is amazing! My kids would love an army bunker too! We have a lot of big boxes around our house. Now I just need to add a tent to every room. Whoa! That is the dream barbie townhouse of any little boy!!! I just showed the 4yr old, his mouth fell open, and he said I WANT THAT! Wow! What a great use of space. My kids love making forts in the t.v. room but I think would work much better (and not fall down or cause mini wars. LOL!) I am off to check out what supplies I have at home. Thanks! Nah! I'll stash this away in my Someday-for-Grandkids file! this is amazing! your kids must have a blast with all the tents...my son was sitting with me when i was looking at this and he loved it. Okay, I thought this was cool when I saw it over at Rae's blog. Now that I see the details of how you did it--AWESOME. And the fact that its made of a sheet set? With the pillowcase for storage bag? And it only cost $26???? WOW. Just...WOW. I LOVE it!! You can see that the boys do, too! I came over from Made by Rae. What a wonderful Project!!! I saw these sheets on clearance last week. Now I wish I had picked them up! Thank you! This blog post will be advertised on CraftCrave in the Handcraft category today (look for timestamp: [17 Feb 01:00pm GMT]). I hope you don't mind, but I linked this up to a party I am having at my blog today because it is so awesome! Just trying to bring you more traffic! This is amazing! Definitely storing this away for when my son will be old enough to enjoy it. Great job! Wow, this is fantastic. So is the hula hoop one! Great job! That is awesome! And it might actually inspire me to clean off my kitchen table! What a great idea! I know exactly what I am making my nephews for Xmas now! Pure Awesomeness! Christmas presents, Christmas presents. This is so awesome. look at those happy guys! This is wonderful!! Nice feature at the made by Rae too, all the stuff for boys is way rad! Super fun. I just know my kids will love this. I think I found my next project. THanks! My boy (currently 17 months) is SO getting one of these in a couple years' time. Wow -- my boys' 6th and 4th birthdays are in a few weeks and we're in another never-ending Minnesota winter here. I think you've just come up with the perfect birthday present. I've tried looking for bed tents for the double bed they share without luck. We make endless forts here but there are always tears because the ceilings never stay up. I love it! What a fun theme for the week! I was out of town a couple of days and came back to so many fun ideas. Thanks! 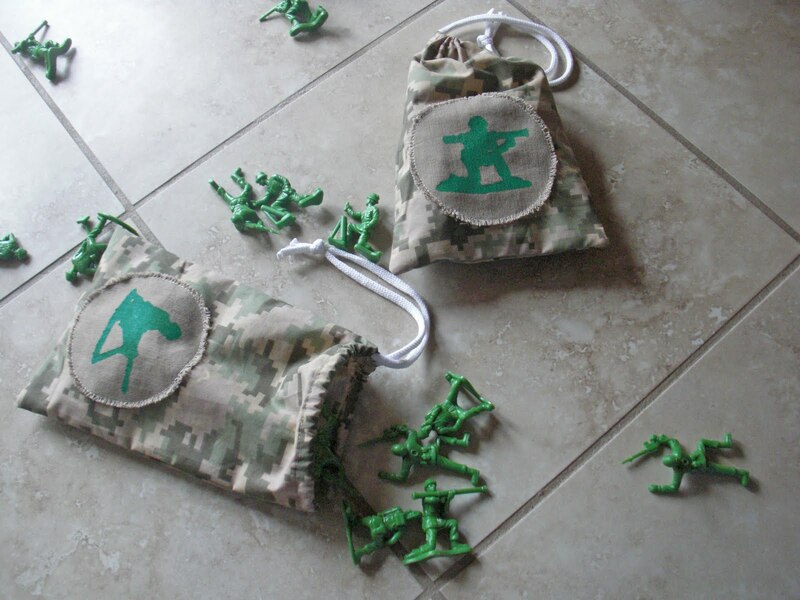 Awesome idea for tons of creative play. My son had a Power Rangers tent when he was young that he played in all the time but it was cheaply made (but the cost wasn't cheap) and took up a lot of space in our living room. 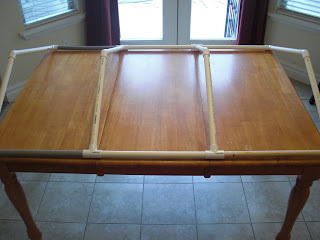 I love that your project uses the kitchen table and is easily removed and stored and double bonus that it is washable. This is so awesome! 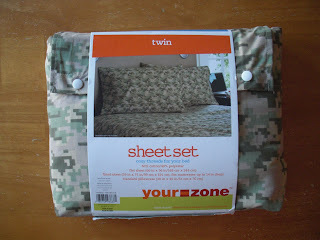 I love that it's made from a twin sheet. Super Fabulous!! I have to make one now. Our kitchen table is very small though. It's only like 3ftx3ft. It'll be a small tent, but he already loves playing under the table. Thank you for showing us how!! I teach Kindergarten. This would make a wonderful reading area in a classroom. THANKS for the directions! Yeah! I love how that turned out! It looks fantastic. I loved your tent week so I linked to you from my blog. Thanks so much! I've shared this awesome project of yours on facebook. I am going to try to re-create what you've done. I, too, am a stay-at-home mommy! I love it, but sometimes I get bored and need projects to do! This is my next project. Thanks for sharing :)! OK, I know this post is a year old, but it's new to me, and I LOVE how this tent of yours turned out!! I'm interested in making a girl-themed version but wonder if you could shoot me the dimensions of your table and the dimensions you used for the pieces you cut (if you still have them on hand). I am so terrible without a pattern, but being able to adapt your numbers for your table to the size of my table would help so very much. Please, please, please send them my way if you still have the measurements you used (and the measurements of you table). Thank you in advance! Hi there, I just wanted to let you know I linked to this project from my blog, Sew Lindsay Sew! What an amazing project. Thanks for the inspiration! 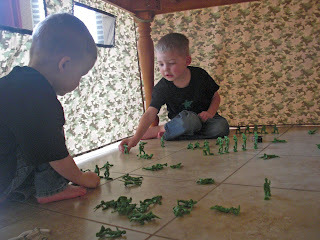 Wow that's a great use of military clothing & i see that the kids are having fun too!